To be honest, I walked in to Workbench Bistro with literally no expectation. I mean, how good can a neighbourhood cafe be? And you know what, they proved me wrong. This hipster cafe is actually pretty amazing and I was surprised by the standard of the food they offered. 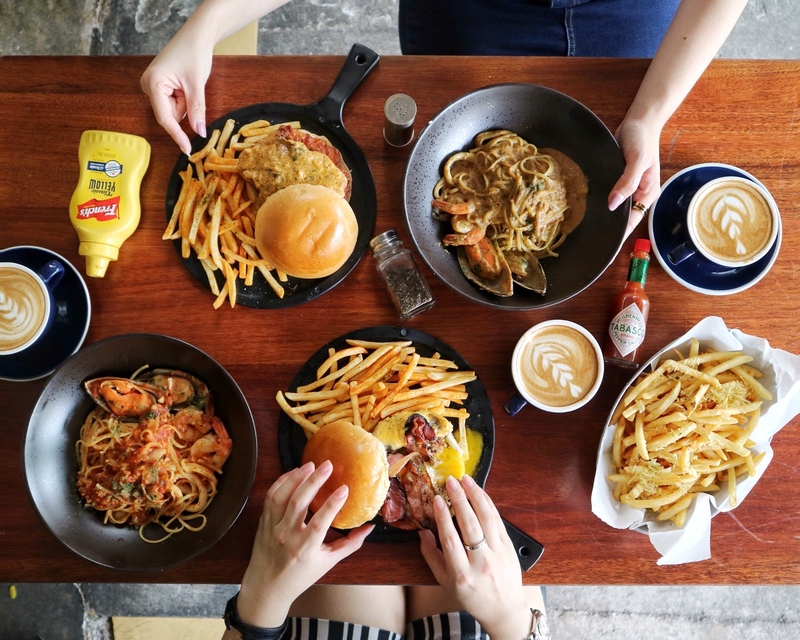 Nestled in the hearts of Ang Mo Kio, Workbench Bistro is a cosy and casual cafe that serves a plethora of Western fare (burgers & pastas) as well as desserts at a very reasonable price. Some of you might have already seen their highly raved-about ‘Explosive Lava Burger’ & ‘Coloured Waffles’ which went viral on the Internet. Together with a group of foodies, we have #triedandtested both of them and have unanimously agreed that they are definitely worth the hype. So, if you haven’t tried the food at Workbench Bistro, it’s time to jio all your family & friends and enjoy a delightful meal this weekend! I’ll be recommending some other specials in this article as well! They were definitely very generous with the portion they served (as you can see in the picture). Coffee was pretty good as well; aromatic and not too acidic. They were really packed during the weekend (better to make a prior reservation) with huge group of families. Always searching for Matcha Latte whenever I visit a cafe. The Matcha Latte at Workbench Bistro is light, floral and has a subtle bitter aftertaste. If you do not prefer a rich Matcha Latte, then you will probably like this! I’m definitely more than willing to fork out $9.90 for this Truffle Fries. Portion was huge, truffle flavour was strong and the fries were really well-fried (crispy and not too oily). Seriously, damn addictive! Chicken was well-marinated and well-fried but I thought the salted egg sauce could be richer. If the sauce was stronger and thicker, this would have been a perfect burger. Fries were well-seasoned with paprika! OMG! Our reaction when we cut the beef patty into half. Imbedded between it is a nicely cooked half-boiled egg that flows insanely when gently sliced. Beef patty was well-seasoned with different spices and very well-cooked (tender & juicy). Highly recommended! This flavourful bowl of laksa pasta is really tasty. Linguine was well-cooked with a great texture. Laksa flavour was fragrant, strong but not too overwhelming. They were also very generous with the portion of seafood served. A must-try! The flavour was really robust but the texture of the pasta could have been better. I thought it was overly cooked (a tad too mushy for me). But I really like the light tomato flavour of the pasta. It was a pity because the macaroni was really well-cooked. If they added more cheese into it, I will love it even more! But if you prefer lesser cheese (healthier), you might want to order this! Cheese/sweet-lovers will probably like this. Waffle was full (not that crispy) and it paired well with the ice cream. Sweet and savoury combo was not too bad! I preferred this as compared to the Cheesy Waffle. Waffle was really crispy and I loved the melted marshmallows inside the waffle. Paired with Matcha and Sea Salt ice cream, calories so damn worth gaining!